The fifth meeting of the 2016-2017 year took place at the National Weather Service Jackson office. The fifth meeting of the 2016-2017 AMS/NWA chapter was called to order at 11:08am by NWA President Eric Carpenter. 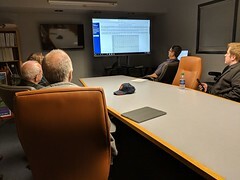 The meeting was held at the National Weather Service office in Flowood. Recording Secretary Joanne Culin recorded those in attendance, with 15 people present. An attendance sheet was passed around that indicated when dues were last collected for each person, or if their membership had lapsed. Minutes from the October meeting were summarized by Recording Secretary Joanne Culin. The business session began with a treasury report. Treasurer David Cox gave the report. At the beginning of the meeting, $277.50 was in the treasury. Two members renewed membership, which added $40 to the treasury. Pizza was ordered using our new buy one get one free card, which cost $39.21. By the end of the meeting, the treasury stood at $278.29. As a reminder, memberships are now valid for an entire year, rather than just through the remainder of the current chapter year. 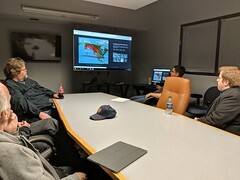 Daniel showed some newly obtained radar data from the ULM radar. This data was from the event on the weekend of January 21-22, 2017. He showed radar from around Morehouse Parish of a potential tornado. The radar is functioning, but data is not being distributed in real time. There continues to be work performed on calibration and there continues to be a beak blockage issue with trees near the radar. Our speaker for the meeting was Will Simmons. Will went to Mississippi State University with Treasurer David Cox. Prior to going into the Air Force, he worked as a TV meteorologist at WCBI in Columbus. He began Air Force training in 2013. He decided that he wanted to be out in the weather more and went to www.hurricanehunters.com and applied for a job through there. He has only been a hurricane hunter for about a year and a half. 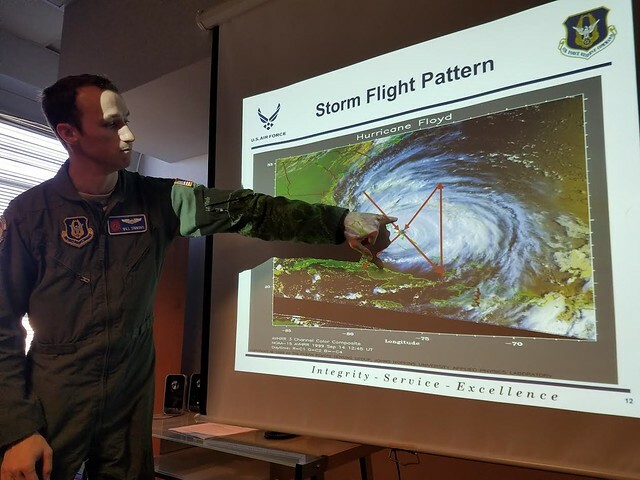 He was hired in 2011 but after going through medical and training, a year of Air Force pilot training, he has only been actively flying into hurricanes for a short time. He has had 34 eye penetrations into hurricanes. The Air Force uses a WC130J and a T6. They have a 5 person crew minimum: pilot, copilot, navigator, loadmaster. A typical mission is about 10-12 hours. They have 10 full time Air Reserve Technician crews and 10 traditional reserve crews. Their main goal is to find the lowest pressure and secondary goal is determining wind speeds. When tasked to fly, they go from 55W longitude all the way to Hawaii. Their base is St. Croix. Their flight levels are around 500 feet to 1500 feet and when the storm is upgraded to a tropical storm, they fly around 10,000 feet. They avoid the freezing level as to avoid lightning strikes, but the plane can handle strikes. The weather officer determines where to fly and where to drop the dropsondes. Will, despite his weather background, is a pilot and is glad not to have that pressure on him. They want to drop the dropsondes to get max wind speeds and into the eyewall. They take about 10 dropsondes, which a lot of them fail. Dropsondes detect the wind speed, direction, dewpoints, etc and use a GPS tracker so that it gets to the National Hurricane Center in minutes. The flight path is on an alpha pattern, but they can alter the plan based on NHC needs or the track of the storm. They can investigate a certain quadrant if needed. The navigator puts in the legs/flight plan but use autopilot a lot. Some countries they have to be careful with because they are not allowed to fly over some and they also avoid flying over land. Will then talked about the 2016 hurricane season. It was an above average year, which means the team spent a lot of time at their base in St. Croix. The season ran from Alex to Otto, with Alex occurring in January and Otto occurring in late November. There were 15 tropical storms, 7 hurricanes, 3 major hurricanes and 1 category 5 hurricane. Outside of hurricane season, the hurricane hunters also fly into winter storms. This occurs from December to April, but due to limited funding, this has not occurred as much in recent years. There is less hunting with winter storms and more set latitudes/longitudes for dropsondes. In the past they did a lot in the region from Alaska to the West Coast, but now they do more East Coast storms. Will then answered questions from the group. He said his first storm to fly into was Hurricane Joaquin in 2015. Since the 1940s, they only lost one crew, which was in the 1970s in Guam. The planes burn about 4000-5000 gallons of gas per hour. There are external fuel tanks that allow their planes to fly longer. They generally fly at 170 knots. Sometimes they bring media on planes with them, but media is not allowed to fly if someone is in training. Planes can also do search and rescue and communicate with the Coast Guard. Turbulence is worse when going through a developing or weakening storm and more stable in a storm with peak intensity. The meeting concluded at 12:07 pm, and it was adjourned. 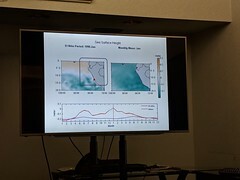 Will Simmons describes flight patterns through tropical cyclones.